JEN: A good start to the week – took a rest from the gym as my body is still a bit sore from the weekend’s exercise. Eating well – alternate protein and protein and veges. I have dropped 2 kg from the start of the challenge which is great. GABY: Feeling good, was a great weekend – feeling relaxed, ready and energised for the week.Good nutrition, switched to non-lactose milk and gluten free. JEN: All on track. Moods still stable, despite being under quite a great deal of stress – it seems to be washing over me, which I love!! GABY: Good work out in the morning – running and cardio circuit on the beach – I I beat my 25 mins to the pier so I added some extra circuit items before coming back! JEN: My second Buti dance class at the gym. I am really feeling full of energy at the end of the day and can push myself in the evenings, which I have never really been able to to before. GABY: Lighter, feeling good did Strengthen and Lengthen workout at the gym, feeling great. JEN: Feeling a bit flat today mentally so I ended having an extra E3 Live shot before the gym – great energy boost and was able to come home and get some work done in the evening as well. GABY: Cardio Barre plus Gillian Michaels workout in the evening – double session!! Nutrition on track, full of energy, went hard-core in the evening, exhausted, good sleep. JEN: Did a spin and abs class this evening. Eating on track and feeling good. GABY: Same as yesterday, feeling strong, did double session again at the gym (wow!!) with gravity and abs class. JEN: Kangoo this morning – crazy exercise class, outdoors in bouncy Kangoo shoes (I will try to take a picture next week) I had loads of energy to push myself and felt strong and balanced. GABY: Did Kangoo with Jen in the morning – really pushed myself up the hills. Relaxed at the beach at the end of the day. Relaxing weekend. JEN: Beach day!!! Had a great rest day with Farmer’s Markets in the morning followed by the beach. I was a bit low on energy so decided to stop for a raw lunch at a cool place called Rawvolution (they also sell E3 Live in a shot and shake!!) Felt 1000% times better and then headed to the beach for a chilled afternoon. I loved it. Ready for W4! GABY: Exhausted…. body in need of rest (haha) relaxing day off. Joined Jen for a raw lunch: mac and cheese and california rolls (all raw). 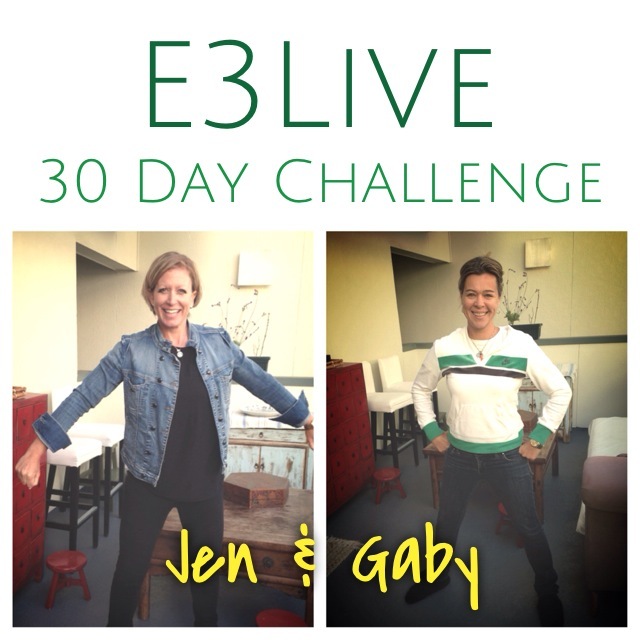 Jen & Gaby are finished with Week 2 of their E3Live 30 Day Challenge – taking E3Live + BrainON and also RenewMe every day for 30 days. 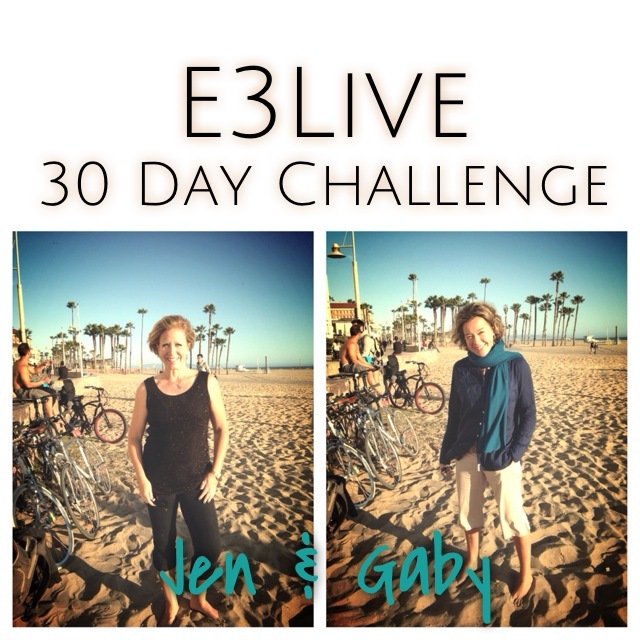 Gaby is feeling energized and Jen feels much more level headed about everything. Jen – Trying to feel good and positive about the week ahead but not too much energy. I pushed myself through a gym class but a little flat today. Gaby – Working most of the day and good eating. Did a workout at the end of the day, felt good but I still have a headache. Slept well. Jen – First thing – XY class at the gym and a better start to the day. Energy has arrived and I feel good. Gaby – Normal working day, light eating, work out at the end of the day, headache still there but getting lighter, not as heavy as last week. I am stopping taking my multi-vitamin to see if that makes a difference. Jen – So today I noticed something pretty amazing and I am very keen to see if it stays… I have always suffered a little from anxiety and nervous feelings – they have just suddenly seemed to disappear. Even when faced with situations that would normally have my heart and mind racing, I am super-calm (but not complacent)… Fabulous news. Enjoyed a lovely Raw lunch and walk on the beach – great way to break up the day. Gaby – Headache almost gone, took an easy day and went for a walk. Did a gym strength class and a run. Feeling better. Jen – Today eating went well and started a planned long-over due office clean out/set up! Also got on top of a lot of tasks that have been bugging me – very calm and nice focus – yay! Gaby – Went to meet an old friend at Santa Rosa, she was staying at a vineyard and we did some wine tastings and very good food and fresh air. I didn’t take my Brain On but I had Renew Me. Off diet day. No headache. Jen – I tackled my entire office – all sorted and clean – excellent focus – something that I have never really had before – and I didn’t once feel like I was hating or fed-up with what I was doing (which I usually would have)… Good eating again today and plenty of exercise at home with cleaning out! Gaby – Still at Santa Rosa, another easy lazy day. Eating well, no exercise and just Renew Me. Sleep a bit average. Jen – Not much sleep, lots of energy and feeling good this morning. Yoga at the beach and cleaning the house – feeling energised and happy. Gaby – Had Renew Me in the morning and set to travel back to LA. No exercise, easy day with reading and relaxing. Good night’s sleep. Jen – Spin class this morning and then a day off. Lovely healthy salad lunch and raw dessert treat. Nice to spend time in the sun and at the beach, feeling calm, positive, energetic, happy and focussed. Gaby – Healthy day with beach run in the morning. I really pushed myself. Good breakfast, back to Brain On and Renew Me. Good lunch and good light dinner. Still no headache and I am not taking multi-vitamins. Will try again next week to see the result.